Your Android Contains Various Types Personal Data i.e. Images, Videos, Gmail/Google Account, Documents Etc. What If Your Phone Is Stolen? You Will Lose All Your Data. But With Anti Theft Apps You Can Protect Your Phone From Being Stolen And Protect Your Data If You Lost It. 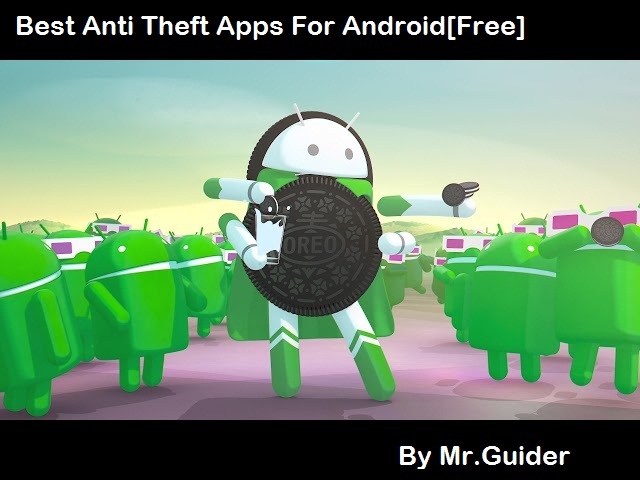 There Are Many Anti Theft Apps Available On Google Play Store For Free. We Have Selected Top Best Anti Theft Apps Which Helps You To Protect Your Phone From Being Stolen. Anti Theft Apps Feature And Work? Anti Theft Apps Allows Users To Set An Action When A Particular Task Is Performed. For Example – If You Set – Erase All Data When Sim Card Change, Then When Someone Remove Phone’s Battery – Change SIM Card – Turn On Phone – Your Android Will Start Reset Process Automatically. Locate Phone On Map – If You Lost Your Phone And You Have Installed Anti Theft App On Your Android, Then You Can Track/Locate Your Android Phone On Map. Bell/Ring/Play Sound – If You Set A Rule, For Example – Your Phone Is Charging, If Someone Disconnects It, Then A Loud Ring Will Help You To Prevent Theft. Reset Remotely – If You Lost Your Phone – You Will Also Lose Your Data. So, To Protect Your Personal Data From A Stranger, You Can Reset Your Android Remotely With Anti Theft Apps. Charging Detection – When Someone Disconnects Your Phone From Charging, A Loud Alarm(You Can Change Alarm Tone Also) Will Help You To Protect Your Phone From Being Stolen. Motion Detection – When Someone Tries To Touch Your Phone, An Alarm Will Intimidate Them Away. Proximity Detection – While Travelling, If Your Phone By Chance Drop From Your Pocket, An Alarm Will Notify You. Change SIM – If Someone Changes The SIM Card, Then An Alarm Will Ring Until The Correct Password Is Entered. Protect The Configuration With Password – This App Comes With A Built-In Lock Feature. So, Thief Can Not Reduce Alam Volume Or Change Configuration Without Knowing You Password. Notifies Owner With New SIM Card Details. About The App – Size – 2.77 MB, Price – Free(Contains Ads, In-App Purchase). Download – Here(Google Play). This Fabulous Anti Theft App Works Even Your Phone Does Not Have An Active Internet Connection. This App Helps User To Protect Their Phone Data/SD Card Data When They Lost Their Phone. How? By Erasing All Data Of Android Remotely. By Sending An SMS – You Have To Enter A Phone Number. Then Specific Message. When You Send SMS From That Specific Phone Number And Message, Your Android Will Start Reset Process Automatically. Reset Android – Replacing SIM Card – When Someone Removes SIM Card And Put A New One. You Can Also Purchase Premium One – This App Will Send You The New SIM Card Details To Specific Number. Wipe SD Card Data – You Can Also Turn On This Trigger. Along With Phone Data, Your SD Card Data Will Also Erase. Protect App Configuration With Built-In App Lock. About This App – Price – Free(In-App Purchase), Download – Here, Size – 3MB. Play Sound – Your Phone Will Sound Very Loud When You Tap On This Option Even When If Your Phone Is On Silent Mode. Lock – With This Feature, You Can Set A Lock On Your Phone Remotely. If Your Android Is Already Locked, Then You Can Change Password Also. Erase – If You Lost Your Phone, And You Want To Protect Your Data From Stranger/Thief, Then You Can Erase All Your Data Remotely. Locate – With This Feature, You Can Track/Locate Your Phone’s Real-Time Location On A Map. About This App – Internet Is Required, Size – Under 2MB, Price – Free. Download: Here. This App Is One Of The Best Light Size App On Google Play Store With Anti Theft Features. You Can Easily Know Who Tries To Check Your Phone When You Are Not Near. If Someone Tries To Unlock Your Phone With The Wrong Password, This App Secretly Capture The Photo Of That Person And Sends The Photo To Your Email Address. Secret – You Have To Only Enter The Email Address. After It, This App Will Start The Work. When A Person Tries To Unlock Your Phone With Wrong Code, A Photo Of That Person Will Be Sent By This App To Your Email Address. Sends You GPS Location Also – Where Is Your Smartphone Right Now!! Detects SIM Card Changes – If Someone Inserts A New SIM Card, Details Of This Action Will Also Include In Email. Record 20 Second Audio Clip. Get The Email When Your Phone Location Changed – In Case, Thief Turns It Back On. About This App – Price – Free(In-App Purchase), Download – Here. Mode – Online. This App Is Similar To Lock Watch. This App Will Automatically Takes Photo If Someone Tries To Unlock Your Phone With The Wrong Code. You Can Set Attempts Limit Also i.e. 3. Along With Picture – This Information Will Also Include – Location. However, Lock Watch Is Better Than This App. About This App – Price – Free(Contains Ads, In-App Purchase), Download: – Here. Size – 2.9 MB. About This App – Size – 4.61 MB, Price – Free(In-App Purchase), Download: Here. Wipe – Remotely Erase Your Android Data, So That It Can Not Be Misused. About This App – Size – 17MB, Price – Free, Download: Here. If You Have Any Suggestions Anti Theft On Apps, Then Please Submit Here. For More Updates – Like Us On Facebook – MrGuider. Follow Us On Twitter – @techhuntr. Subscribe Us To Get Latest Updates.